Ready to go!, originally uploaded by eblackwell. 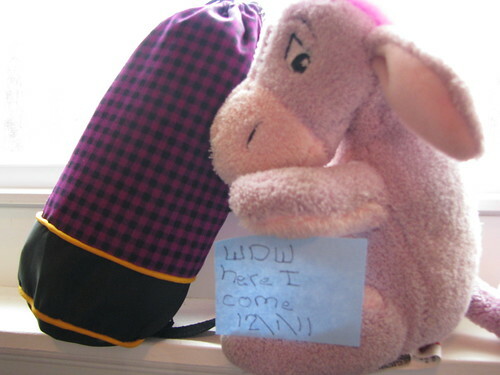 Just look at Eeyore! Packed and all set! The drivers went to bed hours ago so they are set to drive d very early morning shift . marty and son are in the camper having a boys night to themselves ; this way they can stay sleeping when we leave . The baby loves his Disney train and first trip to disney world pin! he has his mickey mouse and see if you're ready to go! saying this with his eyes will be magic for a lot of memories. Vacation is just around the corner! We're getting ready, but oh there's so much to be done! Packing, cleaning the house, last minute trip items, finishing the Christmas decorations! Doing the laundry so there can be packing! But you can see I'm already getting the holiday blog theme going complete with the webcam. Because we are right around the corner from meeting who-know-who! My sister called saying her camper was dead again. This had been going in since she got it. They blame it on all sorts of things. We were bringing it in and I had an accident with it. Messed up two storage doors and one of those yellow bars at a gas station. I am thankful my friend George came through his surgery to remove the cancer from kidney, aorta, and lymph nodes well. I hope they have more good news for him! I'm thankful for our friends who invited us to share Thanksgiving dinner with them. I"m thankful for the friends who actually look forward to seeing me in Florida next week. I'm thankful to be sharing this trip with my sister, my nephew, and his 18 month old son! Oh the memories this will make for us forever, seeing the magic come over his face over and over. I'm thankful for the sight of Daytona and Elphie playing tug of war, the way Casey and Morgan did. That's what I told him at the rehearsal last Thursday. No one would ever have guessed that as John and I became close with the families -- so close that John would become Uncle Luke to the boys -- that I would perform Mike's wedding to Kate. I was thrilled they asked me! I always am when someone does. That they trust me to do something so important... and when I know them, it takes on that whole other level. It was a gorgeous wedding at Brigalias' and the weather warmed enough that we could do the ceremony outside like they wanted. The columns, fountains, gazebo, and small replica of the Philadelphia Art Museum were incredible. Mike and Kate made a beautiful couple.